BRIGHTON, Mich.- Ford Motor Company finally revealed their big news at SEMA 2012! You might want to sit down, because it's going to blow your socks off...literally. 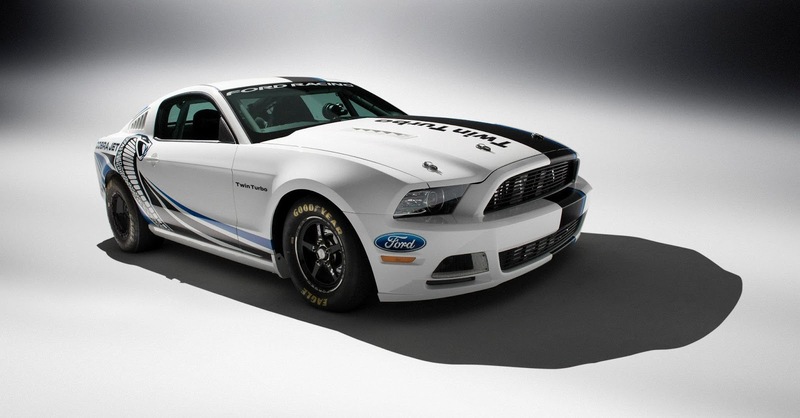 Ford debuted the Ford Racing Mustang Cobra Jet Concept based on the 2013 Mustang Cobra Jet. Once you get past the pure beauty of this pony, you'll thoroughly enjoy the twin turbochargers attached to a 5.0-liter V8 and the fact that it uses the same technology as Ford's EcoBoost Engines! As if the current Cobra Jets weren't fast enough running 8-second quarter miles, the Ford Racing Mustang Cobra Jet Concept's twin turbochargers provide a lower loss in power and as little lag as possible. Now stop drooling and check out these breath-taking photos of the New Mustang Cobra Jet Concept as well as this video of the New Ford Concept in action! If you're not on Cloud 9 yet, you will be once you find out how much money our Ford Mustang Rebates and Ford Mustang A Plan Pricing will save you! Brighton Ford is a family owned and operated business that strives on customer satisfaction, located at 8240 Grand River Ave. just north of I-96 in Brighton. For more information on Brighton Ford visit www.BrightonFord.com or give us a call at (800)-836-8206.